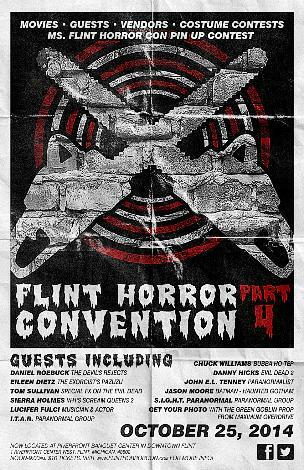 Join us for the 2014 Flint Horror Convention on Saturday, October 25. The convention will bring together horror celebrities, some of the best vendors around, indie horror films, and costume and pin-up contests that will give fans a full day of ghoulish fun. DANIEL ROEBUCK - The Devil's Rejects, Rob Zombie's Halloween 1 and 2, and many others. ---- Mr. Roebuck will be at the convention at 6PM due to his shooting schedule. JASON MOORE - artist known for his work on BATMAN HAUNTED GOTHAM, EVIL ERNIE DESTROYER, THE CRUSADES, and THE DEAD. NO BOUNDARIES PARANORMAL - Paranormal group. AND get your picture taken with The Green Goblin from Maximum Overdrive! Dozens of vendors selling everything from movies, to crafts, to art, to books and more. Indie films from around the world. And all of it for only TEN DOLLARS!